I am a wife, mother, daughter, sister, and friend! I have a degree in Psychology and use it everyday staying at home with my 14 month old! I am on a mission to pay off our debt by saving as much money as I can!! Harlequin is celebrating 60 years of romance novels! So in honor of their celebration and their readers, they are giving away 16 books for FREE via download! They put a $60.00 value on this if you downloaded all the books. Check it out here! Today I am catching up on my daily food totals for our $1 a Day per Person Food Challenge. Lately, it has been very difficult to type up our food journals for the day each night. I do write it down in a journal everyday to make sure I know what we have eaten out of our food supply and the cost of the food. After completing a month of this challenge, my husband and I have discussed how it is working out. So far it has not been terrible; but, it has been a huge eye opener in the way that we eat and how fortunate we are that my mother and stepdad provide us with foods we otherwise wouldn't be able to afford. 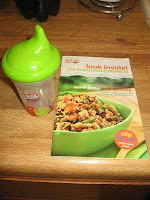 After one week into this challenge, I decided to make a conscious effort to feed my family more well balanced meals. I am trying extremely hard to make sure we eat as healthy as possible provided the amount of money we have to spend on food. With that said, I want my readers to be aware of something. We are not doing this challenge for fun; but, because we have to based on the income we currently have coming in. I wish we had the money to buy all of the fresh produce we wanted, but we don't. So until the garden blooms in the Spring, we are making do with what we can afford and the produce my Mom canned or froze last year. We have decided to change the way we total our $1 a day per person. Up until now, I have been adding up the food at the end of each day, making sure that it is around $3 or less. Many of these days we have been under the $3 mark and my husband has questioned why we can't "roll over" the extra money and use it to eat something nicer the next day. He used the analogy of "rollover minutes" to discribe how he wanted to use the extra money for food. So after thinking about it, I decided he is right. So from now on, I will post our food totals for the week, not the day. We will try and keep it around $21.00 for the whole week, meaning $1 a day per person. This would also help with me being able to blog about other things than just what we eat. We are starting the new format for the challenge tomorrow, so I will update next Sunday on our $1 a Day per Person food Challenge! I absolutely love my mailbox! 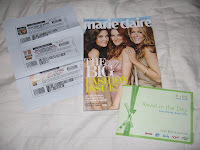 I know past a certain age getting mail isn't usually fun, but lately all the free items are making it fun again! Now I just have to figure out how to get the mailbox to eat the bills, so I never have to see them....that would be an AMAZING mailbox! 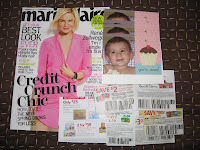 Today, I went to the mailbox and I got a back issue of Marie Clarie (not sure why), coupons from my Aunt Di, and the free photo Valentine's Day cards. The cards are precious! 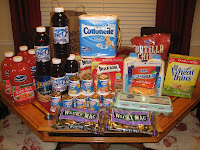 I am not sure what the expiration date is to order them, but check out Melissa's Bargain Blog to see how to order them. I still haven't planned my shopping trips for the week and it is Wednesday. I keep getting further and further behind, but Paul and I have been organizing all the coupons. My old coupon accordion folder busted due to all of the coupons, so we are now organizing them in a 4" binder. We have been working on it for 3 night and not getting anywhere. I have SOOO many coupons! My Mom came down to my house today (she lives 45 minutes north) to watch Jackson while I went to the doctor. If you read my blog regularly, you will notice that it seems like I go to the doctor every Tuesday. I have have been seeing a fertility specialist and was officially diagnosed today with PCOS (Polycystic Ovarian Syndrome) today. As much as it was not great news, I was definitely relieved to finally get some answers to the questions I have been searching for since I was a teenager. While she was here for the day, we went to get a few of this week's deals. The first stop was at Petco. 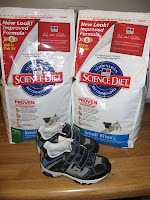 They have their Science Diet on sale this week, $8 off selected 35lb to 40lb bags and $4 off selected 4.5lb to 17.5lb bags. Plus, we had coupons for $5 off each of the bags. We also stopped by Target, since it is in the same shopping center. We were able to find my son a pair of tennis shoes that were 75% off. WooHoo for the great bargains! For some of you who may just be reading my blog for the first time, Paul and I have challenged ourselves to eat for $1 a person a day for 2009. Jackson's food is also included except for his milk. Milk is too expensive to included in these totals and since he is only 14 months old he needs it. It adds about $7 extra dollars a week to our totals, but lately I have been using gift cards or ExtraCare bucks to get our milk. My Mom gives us a lot of their leftovers or homemade foods, so when you see things listed as Grammy and Grandpa's food it is from them. We are on Day 25 and so far we are succeeding in the challenge! It has been tough, but coupons are making it possible! Marvelous Mail and a Thank you! Look what I got in the mail!! Okay, so it may not look so exciting to some of you, but these are the first free items that I have received and I am very excited about them. randomly coded, this site is betterinpink!